Dallas Stars training camp is less than a month away. The Stars decided to move camp south this year. They will be utilizing the home of the Texas Stars in Cedar Park. Camp begins on Friday, September 18th and runs through Tuesday, September 22nd. For more details on the schedule including practices open to the public click here. As camp winds down, the Stars will look to finalize their 2015-16 roster. The maximum number of active players allowed on an NHL roster is 23. Ultimately, I believe the Stars will choose the players who win jobs in training camp and potentially expose one or two players they can live without via the waiver process. Goaltending is the one area where the roster is set. The Stars signing of Antti Niemi in July solidified the situation between the pipes. Niemi and incumbant starter Kari Lehtonen will share the Stars goaltending duties in 2015-16. Barring a training camp surprise, the Stars forwards are pretty well set. The only questions are the line combinations and will they keep one or two extra forwards? Once the season starts they will dress twelve forwards with one or two healthy scratches. “The Stars would like to have a first line of Jamie Benn-Tyler Seguin-Patrick Sharp” according to Dallas Morning News reporter Mike Heika, who was a guest on this past weekend’s Stars Sunday Show on 1310AM The Ticket. Heika went on to suggest a possible second line combination of Valeri Nichushkin-Jason Spezza-Ales Hemsky. If we pencil in Antoine Roussel and Cody Eakin on the third line, Vernon Fiddler centering the fourth line, we are left with Patrick Eaves, Curtis McKenzie, Colton Sceviour, Brett Ritchie and Travis Moen competing for the last three forward spots. You have to figure Eaves lands one of the spots. The Stars love his versatility as he can play on any of the four lines. I see McKenzie and Moen competing for the same spot. Both play a rugged style and are willing fighters. However, there won’t be a need to dress both players. Moen, 33, is on a one-year deal ($1.85M), while McKenzie is on a cap friendly two-year deal ($675,000 per season; two-way for 2015-16). Dallas Stars make it official: LW Curtis McKenzie re-signed to two-year contract extension. That leaves Colton Sceviour and Brett Ritchie competing for a lineup spot. Both are offensively skilled and proven scorers at junior and minor league levels. Often times these types of players require top six minutes. Thus far both have had a very small sample size of NHL top six minutes. Ritchie, McKenzie and Nichushkin are also still on two-way contracts for 2015-16 making them exempt from waivers. It will be interesting to see if Hemsky (recovering from off-season hip surgery) or Nichushkin get off to a slow start at camp. If so, it could lead to a legitimate top six opportunity for Sceviour or Ritchie. For those wondering about Rich Peverley, he remains undecided about his future and would be an unrestricted free agent, if he returns. The Stars have eight NHL defensemen on one-way contracts. If they chose to keep all eight, they would only be able to keep one extra forward. Conversly, if the Stars keep seven defenseman, they would carry two extra forwards. John Klingberg, Johnny Oduya, Alex Goligoski and Jason Demers are locks for four of the starting six spots. 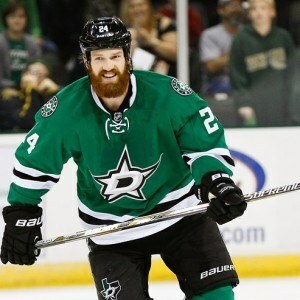 Patrick Nemeth, Jordie Benn Jryki Jokipakka and Jamie Oleksiak will compete for the remaining two starting spots. Also in the mix is newcomer Stephen Johns. He is on a two-way contract but could very well make the opening night roster. So who is truly on the outside looking in? 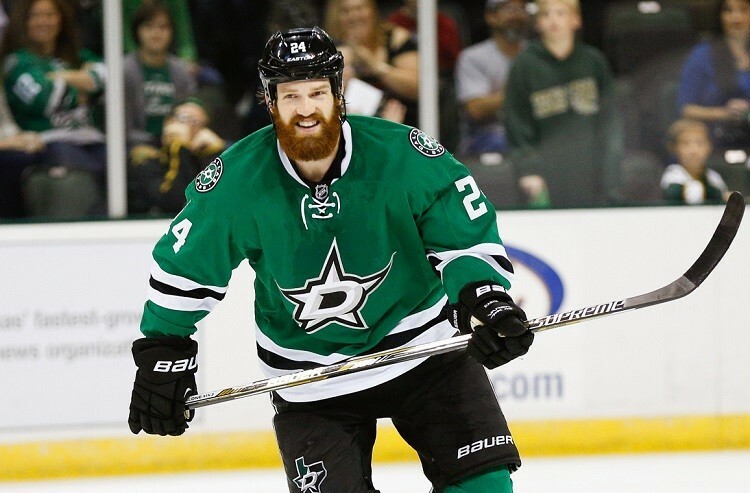 Last season Jordie Benn was often the target of Stars’ fans fury. While he appeared to struggle at times from an “eye test” perspective, only eleven other NHL defensemen played more games last season and had a higher Corsi For Percentage than Benn’s 54.43%. That being said, Benn, 28, is heading into the last year of his contract and could use a strong camp to solidify his spot. Jamie Oleksiak is another player under the microscope. Is it perhaps an ominous sign that Oleksiak’s name is not listed on the Stars current roster? The hulky 6’7 defenseman has decent skills for a man his size but doesn’t assert himself physically enough. Ironically, Johns beat Oleksiak badly on the goal that knocked the Texas Stars out of last season’s AHL playoffs. By the end of training camp, Johns performance could end up knocking Oleksiak out of the lone star state altogether. Jokipakka, 24, is coming off a solid rookie season with the Stars. Nemeth, 23, missed most of last season due to a gruesome arm injury, but made it back in time to finish the year with Dallas. The Stars signed Jokipakka and Nemeth to one-way, two-year deals at $900,000.00 per season so you have to figure they want to keep them up with the big club. In conclusion, the path of least resistance indicates McKenzie and Ritchie starting the season with the Texas Stars. However, count on Stars GM Jim Nill and coach Lindy Ruff keeping the best 23 players regardless of how it impacts those on the outside.